Singh’s invitation to the celebration of a “national” science day is the ironic reversal of the Galileo indictment. 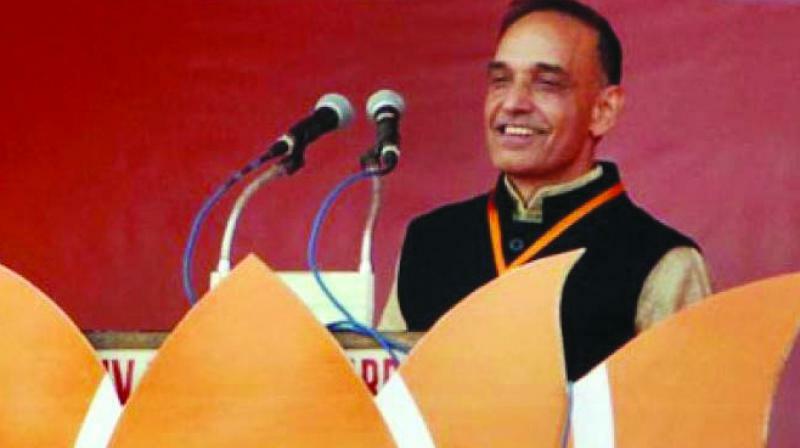 Satyapal Singh must have noticed that the economic and technological advance of the Indian nation in the past few decades has been fuelled by an understanding and deployment of the technological offshoots of these very theories. That love is just a mad enterprise. Where shall we go, what shall we do? Arecent item in the Indian newspapers put me in mind of the trial of Galileo who was arraigned before a papal court for saying that the earth moved round the sun and the centre of the God-created universe. He had, he thought, astronomical evidence for this, at the time, radical assertion. He was tried for heresy, the punishment for which was death. As any sensible person would have done, knowing that the intelligent must make concessions and stay alive, he denounced his own theories in open court and said he had been wrong. Of course the earth was stable and stationary and the sun and the stars and planets moved around it. After all it was where God had planted his proud creation. (They didn’t know about Superman from the planet Krypton at the time). The court accepted his retraction and let him off the charge, but as he was leaving the court he muttered under his breath “Eppur si muove!” — and yet it moves! The report that triggered this recollection was the invitation to the India’s junior human resources development minister Satya Pal Singh by the Indian National Science Academy and the Indian Academy of Sciences as chief guest to their celebration of National Science Day on February 28. Mr Singh’s invitation to the celebration of a “national” science day is the ironic reversal of the Galileo indictment. Mr Singh is an evolution-denier. After being enrolled as an education minister, he told a gathering in Aurangabad that Darwin was “scientifically” wrong. Now Mr Singh doesn’t profess to be a scientist of any sort. He bases his assertion on the fact that no one has heard or read about “seeing a man turn into an ape”. Neither was such a transformation mentioned in the stories told to him by his grandparents. Regarding this fact, I can bear out the absolute truth of what Mr Singh says. Evolutionary theory tells us that it took billions of years for the transformation of one species, through natural selection and the cruel and indifferent process of the survival of the fittest, to evolve into a “higher” form. In the stories that my grandparents told me and in several books, people have lived for a considerable number of years. I don’t know if any of them reached a few billion and could, therefore, have witnessed the transformation of the ape species into humans, much as a camera can observe the blossoming of a flower if it is focused on it for weeks. Mr Singh should be told that the evolutionary theory was not formulated by Darwin, and ratified by thousands of scientific observations and scientists all round the world, through listening. Darwin observed a connection between species and archaeologists today have turned up evidence, such as the skeletons of evolving stages of homo sapiens, which add proof and detail to his theory. About stories told to him by his grandparents: that may be a valid source of learning about Krishna or Hansel and Gretel, but it doesn’t lead to scientific understanding. Of course, Mr Singh is entitled to rely for his knowledge of the world entirely on the religious or mythological texts he reads — or on the stories his grandparents told him. It’s a “free country”! But that he is a minister in the education ministry, even though it goes by a different name, is somewhat alarming. He has, in this capacity, even said that the theory of evolution should not be taught in schools and colleges. I am sure when Mr Singh goes into his office and home he uses lights and airconditioners. Perhaps, he even watches television and uses a computer. It may be that Vedic texts or his interpretation of them do tell him how to generate electricity and pass it through wires to his house, and it is not impossible that through the stories his grandparents told him he got a firm grasp of the theory of relativity and quantum mechanics. Of course if these texts, or his Daada and Daadi, said nothing about Maxwell’s equations, Einstein or Heisenberg’s discoveries, then surely Mr Singh ought to, in his lofty capacity in the education ministry, tell the Indian institutes of Technology and other universities and educational institutions to stop teaching these deviant theories. Mr Singh must have noticed that the economic and technological advance of the Indian nation in the past few decades has been fuelled by an understanding and deployment of the technological offshoots of these very theories. His Prime Minister’s “Make in India” would, with no support from scientific method and a reliance only on myth, ancient texts and the stories our grandparents tell us, mean at best “making” handloom fabrics and bows and arrows for weaponry — not much use to the population or our defence forces. Mr Singh has not been invited by these august bodies to voice his opinions on post-Darwinian, Einsteinian, Heisenbergian science or indeed the discovery of C.V. Raman, who won the Nobel Prize for Physics as early as 1930. The two academies, which have invited him, I would imagine, did so out of respect for his office rather than any of his opinions, have already condemned his statements as “having no scientific basis”. Scientists are polite. It’s like lawyers saying that serial killing “has no legal basis”. Galileo was holding on, in his heart if not publicly, to the truth he had discovered through observation, deduction and the functioning of the scientific method.